I REALLY wanted this to be a great book. The title and the introductory chapter led me to believe it would speak to those of us in the process of rebuilding a faith that has taken some serious hits from life. This is not that book. The problem isn’t the book so much as the marketing: It’s not a book about the Christian faith. The author is a pastor, but does not seem all that impressed with Jesus, other than as a role model. In this book, Christianity is merely one among the many religions of the world, all of which are depicted as more or less similar. It skims the surface of all religions and concludes that our problems…and therefore the answers…are inside of us. 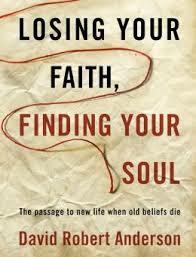 In terms of where the author finds his faith, I’d say he’s mostly a Buddhist, with some new age psychology influence. Perhaps I just didn’t read the marketing materials closely enough. I was pretty sure this was pitched as a book about Christianity. If you’re looking for a book that discusses all the faiths of the world as somewhat similar, and uses vague challenges to suggest that if there’s a problem in your life, it’s you–your ego, your unwillingness to evolve/forgive/become your true self–then this is as good as the many others out there. The writing is solid and the stories winsome. But as someone who came to the Christian faith AFTER trying most of the things the author suggests, I have to say: I don’t think this book is all that spiritually helpful. This entry was posted in Books on November 27, 2013 by Trish Ryan.